This is a really bad choice for web app. and their example only proves it. 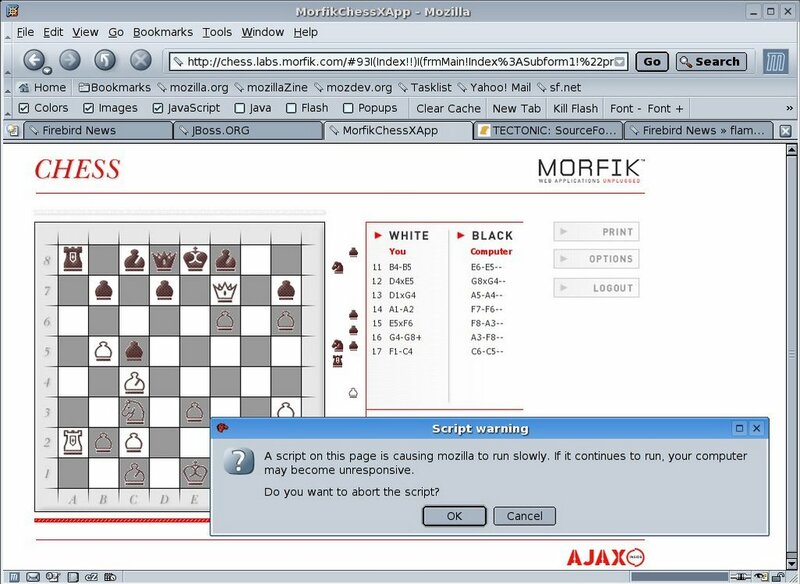 After “check mate”-ing it in only 17 moves, the game started to consume 100% CPU. Luckily Mozilla figured out that it is better to shut it down (see screenshot). My machine is AMD Turion(tm) 64 Mobile Technology MT-30 running at 1.6GHz. It has 512MB RAM, but only 1/2 of it is really used. Let’s face it. AJAX is cool, but uses are limited. Being web-apps developer myself, I conclude that there are cases for AJAX, and there are cases when it shouldn’t be used. The smart developer isn’t one who knows how to implement it, but one who knows where and when to implement it.